The lifeless body had lain on the floor of a St. Paul, Minnesota, speakeasy for about four hours before authorities received an anonymous telephone call near midnight on May 9, 1924. On-scene inspection revealed some ten stab wounds to the victim’s upper torso, including four to the heart. Predictably, the deceased was no stranger to investigators. He was Baseball Wilson, a middle-aged ex-con with “a sensational police record.”1 Investigative measures were subsequently undertaken but in Prohibition Era St. Paul, identification of the slayer of a local low-life was something less than a law enforcement priority, and the crime went unsolved. Likewise, little is known about Wilson’s entry into the game. Nineteenth century baseball authority David Nemec has found Wilson, primarily a catcher but with some defensive versatility, on the roster of the What Cheer club of the unrecognized Iowa State League during the 1887 season. The following year, he spent time with the Champaign (Illinois) team of the Indiana-Illinois League. In 1889, he moved on to a club in Oregon, Illinois.5 Then, like a host of other fringe talents, he became a beneficiary of the employment opportunities spawned by the advent of the Players League. The 1890 Pittsburgh Alleghenys were an awful club, going 23-113 (.169) and setting a (then) National League record for single-season losses in the process.8 Abandoned by hometown fans early in the season, the Alleghenys played the majority of their games on the road where they fared even worse (9-88, .093). Bill Wilson’s limited ability made him an apt member of this club, but he was far from the worst Alleghenys player. His .214/.271/.270 slash line in 304 at-bats was a bit below the .230/.300/.294 Pittsburgh norm, but his defensive play drew occasional praise. Sporting Life adjudged him “a fine throwing catcher,”9 and noted that he was “becoming a fair first baseman”10late in the year. During the ensuing off-season, the paper’s Pittsburgh correspondent called Wilson “the best man on last year’s Pittsburg team” and lamented the fact that new club ownership “don’t seem to want him.”11But with the Players League disbanded and its members mostly returning to their former clubs, Wilson had no chance of being retained by Pittsburgh. Wilson, moreover, undermined any prospect for reengagement by cultivating an unsavory reputation. Teammates and fans wondered how a modestly paid backup could afford the flashy jewelry that Wilson sported. And by season’s end, two different women had filed breach of promise suits against him12 – this despite the fact that Wilson was already married.13 Like most other 1890 fill-ins, Wilson spent the off-season looking for a new job. Wilson began the 1891 season with the Kansas City Blues of the minor league Western Association. His early reviews were favorable, with Sporting Life “much pleased with the work of Wilson as a back-up. He is quick and active, and fast on the bases. Besides, he is a swift and accurate thrower and a moderately good batter.”14 In time, however, a meager .176 batting average and shaky work behind the plate – 22 errors and 19 passed balls in only 33 games – prompted his release. But not before Wilson had managed to disgrace himself. On the club’s return from a season-ending road trip, Wilson “went on a debauch,”15 abandoning his ailing wife at a train station in Council Bluffs, Iowa. Sympathetic teammates arranged Mrs. Wilson’s removal to a local hospital, and thereafter paid her train fare home to her parents in Western Pennsylvania. Meanwhile, Wilson snuck off to the West Coast. The revivification of Bill Wilson’s playing career began in 1894. Signed by the Minneapolis Minnies of the Western League, Wilson enjoyed a spectacular season. Doubtless benefitting from the elongated 60’ 6” pitching distance instituted the previous season, Wilson batted a power-packed .320 in 129 games. His 55 extra-base hits included 20 home runs, mostly hit in bandbox Hiawatha Park. He also stole 30 bases and scored 112 runs. In the field, Wilson handled four defensive positions (third base, 84 games; outfield, 28 games; catcher, 13 games, and first base, 6 games) for the middle-of-the-pack (61-68) Minneapolis club. Of more lasting impression, the 1894 season saw the emergence of the combative, foul-mouthed persona that Wilson would display for the remainder of his professional career. He became the “Scrappy Bill” lauded by the hometown press, the “Dirty Bill” reviled elsewhere. Nevertheless, Wilson’s performance in the high minors did not go unnoticed, and during the off-season he was drafted by the Louisville Colonels, a reliable tail-ender in National League standings. The Colonels were coming off a dismal last place (38-93) finish and in desperate need of new blood. Installed as the club’s frontline catcher, Wilson struggled. His batting – a substandard .213/.257/.272 slash line – reverted to 1890 levels, and his receiving was little better. Wilson led the NL in passed balls allowed (34) and committed 29 errors as well. More baserunners (187) stole on him than on any other catcher in the circuit. But Wilson’s caught-stealing total (111) was second-best among league backstops, and he was game and durable, reaching 100 games caught before any other NL receiver.25 And this despite suffering a broken hand midway through the season. “Wilson is a glutton for work, and it is at his own request that he is in the game day after day,” reported an admiring Sporting Life correspondent.26 In the end, appreciation of Wilson’s willing spirit prevailed over doubts about his playing talent, and Louisville reserved him for the next season. Although Bill Wilson would play another six-plus years of professional baseball, his major league days were now behind him. Over parts of three seasons, he had appeared in 219 games and batted a meek .208, with little extra-base power and only 75 RBIs. He struck out (102) more than twice as often as he walked (45), although he managed to steal 17 bases. In 171 games at his primary position as a catcher, Wilson posted a substandard .913 fielding average, with 78 errors and 68 passed balls. To make matters worse, he was not particularly liked by teammates, and fairly despised by away-game fans and the out-of-town sporting press. About his only assets were a strong throwing arm, defensive versatility – he filled in passably as both an outfielder (25 games) and infielder (21 games) – and gameness. Beginning with his signing with the Detroit Tigers in early-July 1898, Wilson spent the coming seasons bouncing from team to team in the Western League. His itinerary also included stops in St. Joseph (late 1898), Kansas City (1899), Omaha (1900), and St. Paul (1901).30 True to form, Wilson’s tours of duty featured a number of physical altercations, including a “good-and-plenty”31beating at the hands of umpire Al Mauck during a 1900 game in Pueblo. Wilson, meanwhile, recovered from his braining and was back in uniform within two weeks. By 1902, he was a member of the last-place (35-103) Peoria Distillers of the WL. The following season, Wilson was appointed player-manager and led the Distillers to an improved (57-69) sixth-place finish. When Peoria dropped out of baseball in 1904, Wilson hooked on briefly with the Toledo Mud Hens of the American Association, batting .213 in limited play prior to his release. 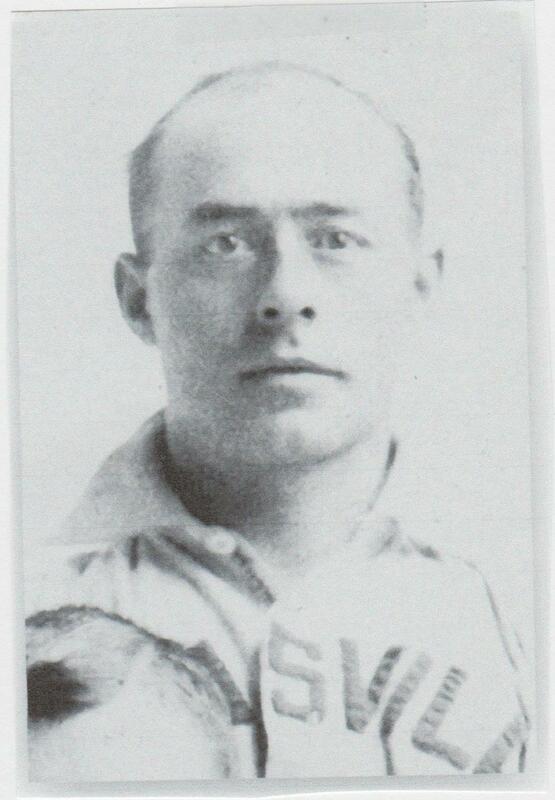 Descending all the way to the Class D Northern League, Wilson then signed as player-manager for the Winnipeg Maroons. In 30 late-season games with the Maroons, he batted .214. Preseason reports had manager Wilson diligently at work recruiting talent for the 1905 Winnipeg team.35 But by May, he was out, replaced as manager by Harry Clayton.36 Purportedly, Wilson intended to pursue business opportunities in Illinois.37 But aside from tending bar, Wilson had no job skills apart from playing baseball. Years later, an acquaintance would relate that Wilson was out of work and drinking heavily by 1907.38 From there, Wilson sank into a life of crime. During his time in Leavenworth, Wilson amassed enough disciplinary infractions to max out his sentence. Still, a correction official allowed Wilson to keep a baseball bat sent to him in the mail. Recently, it has been speculated that this event may have prompted the beginning of recreational baseball by inmates at the prison.41 Whatever the case, by the time the game took hold at Leavenworth, Wilson had been remanded to St. Louis for prosecution on the federal charges preferred against him there. Those proceedings culminated in conviction and additional prison time. Following his release from prison, Wilson reputedly became associated with the underworld in several Midwest cities,42 including the notoriously violent Purple Gang in Detroit.43 To both criminal associates and police, he was known by the alias Baseball Wilson. On May 9, 1924, Wilson was stabbed to death inside a St. Paul speakeasy (euphemistically referred to as a “soft drink bar” in press accounts).44 When police were summoned to the scene hours after the incident, only the body of Baseball Wilson, the victim of ten knife wounds to the upper torso, and some abandoned coats remained on the premises. The writer is indebted to 19th-century baseball authority David Nemec for providing information on Bill Wilson and for his careful review of this bio in draft form. The primary sources for the biographical information presented herein are materials contained in the Bill Wilson file maintained at the Giamatti Research Center, National Baseball Hall of Fame and Museum, Cooperstown, New York; the entry for Wilson in David Nemec, Major League Baseball Profiles, 1871- 1900, Volume 2, and certain of the newspaper articles cited below. Unless otherwise noted, baseball stats have been taken from Baseball-Reference and Retrosheet. 1. According to the St. Paul Dispatch, May 10, 1924. 2. See “11 Men, 4 Women Shed No Tears at Funeral for Baseball Wilson,” St. Paul Dispatch, May 16, 1924. 3. As far as the writer can tell, the Wilson birth date and place first appear in the 1951 edition of the baseball encyclopedia compiled by Turkin and Thompson, where our subject’s name is given as William Wilson. The middle initial “G.” debuts in the 1989 edition of Total Baseball. The original source of any of this appears untraceable, but MLB Historian John Thorn was able to direct the writer to a listing for “William G. Wilson, ballplayer” in the 1898 Louisville City Directory. 4. Admission record for William Wilson, alias Baseball Wilson, No. 6636, United States Penitentiary, Leavenworth, Kansas, dated July 16, 1909, contained in the Bill Wilson file at the Giamatti Research Center. A common surname and the paucity of biographical detail make Wilson difficult to identify with any semblance of confidence in the 1870 and 1880 US Census. Besides ex-wife Helen E. Wilson of Chicago, the only familial member discovered by the writer is an unnamed brother reportedly stationed with the 5th Cavalry in San Antonio, Texas during the mid-1890s. See Sporting Life, January 31, 1897. 5. Email of David Nemec to the writer, April 22, 2015. Wilson may also have played for a team in Oshkosh, Wisconsin during the 1887 and 1888 seasons. No stats for Wilson with any of these pre-1890 clubs are available. 7. At the time that this bio was being drafted, Retrosheet credited Wilson with serving as an emergency fill-in umpire for five Pittsburgh games during the 1890 season (as well as a handful of games during the 1892 and 1893 seasons). But the Wilson who called these games was a Pittsburgh baseball fan/real estate operative named William L. Wilson, rather than our subject. See columns by Pittsburgh sportswriter A.R. Cratty mentioning ex-umpire Wilson in Sporting Life, June 1, June 18, September 28, and November 23, 1907, and March 7, 1908. 8. Before the decade was out, the Alleghenys would be supplanted in the record book by the legendarily bad 1899 Cleveland Spiders, 20-134 (.130). But the 1890 Pittsburgh Alleghenys still hold the record for the all-time worst single-season road record. 9. Sporting Life, June 7, 1890. 10. Sporting Life, September 27, 1890. 11. Sporting Life, January 31 and March 28, 1891. 12. As per David Nemec, Major League Baseball Profiles, 1871-1900, Volume 2 (Lincoln, Nebraska: Univ. of Nebraska Press, 2011), 272. 13. According to The Sporting News, October 10, 1891, Wilson married an unnamed convent-educated young woman from nearby Monongahela, Pennsylvania sometime in 1888. Whether this Mrs. Wilson was the ex-wife named Helen E. Wilson who corresponded with Wilson during his incarceration in Leavenworth some 20 years later is unknown, but seems improbable. 14. Sporting Life, May 3, 1891. 15. As reported in The Sporting News, October 10, 1891. 16. As per the 1892 Reach Guide which provides no statistics for Wilson’s time with Spokane. 17. As reported in Sporting Life, March 19 and 26, 1892. 18. As per David Nemec, email to the writer dated May 6, 2015. 19. As recounted in Sporting Life, July 20, 1895. 20. According to Western League correspondent Hal W. Reed in Sporting Life, March 28, 1896. 21. Baseball-Reference provides no stats for Wilson’s 1896 season with Columbus. The numbers above were published in Sporting Life, January 30, 1897. 22. As per Sporting Life, May 9, 1896. Reportedly, Columbus teammates chipped in to pay the $50 fine imposed on Wilson for starting the fight. 23. As reported in Sporting Life, August 1, 1896. Rather than pay the fine imposed on him, Bob Clark, a former major league catcher, resigned his Western League umpiring position. 24. See e.g., the Denver Post, July 10 and 15, 1900. 25. As reported in Sporting Life, September 18, 1897. At season’s end, 105 games caught made Wilson the National League’s second-most active catcher. 26. Sporting Life, September 11, 1897. 27. As reported in Sporting Life, October 23 and December 16, 1897. 28. As reported in Sporting Life, April 2, 1898. Only 18 months earlier, the father-in-law who despised Wilson had died, leaving a reported $8,500 to Bill’s wife. Upon hearing the news, Wilson sped to Monongahela to “help set up the estate.” See Sporting Life, October 3 and 10, 1896. 30. Unaware that it is dealing with the same player, Baseball-Reference has two separate entries for our subject. Wilson’s major league statistics, plus partial stats for his 1902 to 1904 seasons in the minors, are recorded under the name Bill Wilson. His minor league numbers from 1891 to 1900 are listed under the name Willie Wilson. 31. As per the Denver Post, July 10, 1900. 32. As reported in the Omaha World Herald and Sioux City (Iowa) Journal, July 10, 1900. 33. As reported in the Sioux City Journal, July 22, 1900, the Rockford (Illinois) Morning Star, July 24, 1900, and elsewhere. 34. A retrospective on the incident entitled “The Most Disgraceful Affair Ever Witnessed” is posted on the Minneapolis Millers/Baseball History Daily website. 35. See Sporting Life, February 15 and March 15, 1905. 36. As reported in Sporting Life, May 20, 1905. 37. As per email of early minor leagues expert Reed Howard to the writer, dated April 27, 2015. 38. Reported in the St. Paul Dispatch, May 16, 1924. 39. As subsequently recounted in the St. Paul Dispatch, May 10, 1924. 40. United States v. William Wilson, Judgment of Conviction and Sentence, dated June 30, 1909, contained in the Wilson file at the Giamatti Research Center. 41. Bob Rives and Tim Rives, “Pros vs. Cons: Federal Leaguers versus Federal Prisoners at Leavenworth,” Baseball Research Journal, Vol. 44, No. 1, Spring 2015, 66-67. 42. According to the St. Paul Dispatch, May 10, 1924. 43. As per Nemec, 273. 44. See e.g., the Aberdeen (South Dakota) American, Minneapolis Tribune, and St. Paul Pioneer Press, May 10, 1924. 45. The Wilson death certificate classifies the death as a homicide from multiple stab wounds to the chest, lungs, and neck. The document, informed by an acquaintance named B.P. Allen, is otherwise unilluminating. It does not even provide a home address for Wilson, much less any personal or family information. 46. See e.g., the St. Paul Dispatch, May 12, 1924. 47. As reported in the Aberdeen American, Minneapolis Tribune, and St. Paul Dispatch, May 10, 1924. 48. As per the St. Paul Dispatch, May 12, 1924. 50. St. Paul Dispatch, May 16, 1924.